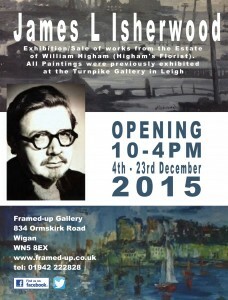 A very successful exhibition and sale of works by J Lawrence Isherwood was held 3rd – 24th December 2015. Framed-Up, the Wigan gallery and framers exhibited the paintings from the estate of well known florist William Higham. All the paintings had previously been exhibited at the Turnpike Gallery in 2009.